It’s been 5 years since the Samsung Galaxy Note series was launched and a new word subsequently appeared in people’s mind “Phablets”. A device which could act as a phone & a tablet and the legacy continues. Mobile manufacturers adopted this and started to produce Phablets. There is always some war going on between Phablets and Tablets. While both of them come with similar features and provide same facilities, the only difference between them is the actual screen size. Phablets go with a slightly smaller screen size as compared to tablets. Moreover, Phablets are trending quite much these day, since they are affordable and comparatively more portable. Hence, there are more and number of Phablets being announced everyday with additional features. One such Phablet that is launched recently is Leagoo T1 Plus 4G Phablet which you can buy directly from Gearbest for just $137.91. The Phablet comes with some of the most remarkable features. Let’s start with the overview, the Leagoo T1 Plus 4G Phablet is powered by the latest MediaTek MTK6737 1.3GHz processor which has a quad-core chipset coupled with a Mali T720GPU clocked at 1.3 GHz and 3 gigs of ram. So you can expect good performance in gaming without any lags. There are 16 gigs of inbuilt storage with memory card expansion up to 128 GB and a 2660 mAh nonuser removable battery. The phone can last more than a day with its huge battery capacity with moderate usage. The phone is a dual sim unlocked with LTE capability. Now let’s talk about the build. The phone is completely built out of metal and really looks premium and light while holding it due to its metal construction and equitable distribution of weight and a thickness of just 7.5 mm which is really slim. The front side of the phone can be seen with a 5.5-inch screen, a front camera and a microphone located above the screen. Also, the device comes with some standard on-screen Leagoo buttons .Do note that the T1 Plus can get a little warm due to its metal build. The Phablet has a fingerprint scanner on the back which is really fast. Now let’s talk about display. The phone has a 5.5 inch 1080p Super HD arc display and looks beautiful . The rear camera is an 8MP camera with an aperture of F2.2 with auto focusing and dual tone flash. The Leagoo T1 Plus 4G Phablet produces really good pictures with amazing accuracy and clarity. The front facing camera is an 8MP for much better selfies. Now let’s talk about the software.The Leagoo T1 Plus 4G Phablet comes with android 6.0 with a custom skin. 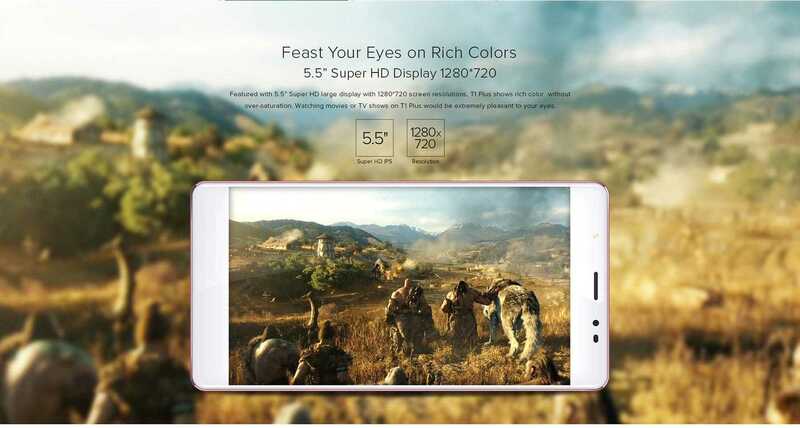 At these specifications, the phone is a good deal for its price and that is 129.99 USD. Isn’t it amazing? I don’t think there are many compromises made considering it a budget Phablet device.